MARTIN SCHWENK started his career as a trainee at Daimler in 1992. Since then, he has worn several hats across continents for the German automobile giant. Before he replaced Roland Folger in November 2018 as chief executive of Mercedes-Benz India, he was chief financial officer of the company in China. 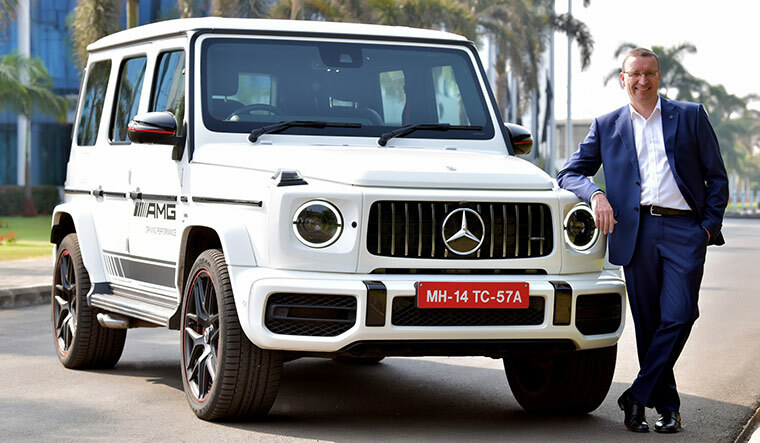 Schwenk has big plans for Mercedes’s silver jubilee in India. In an exclusive interview, he gives a glimpse of the carmaker’s electric vehicles and hybrids. Some of the hesitation which is on the market in the luxury segment will be released as soon as we have the new government. You have come to India from China. How are you settling in? I just finished three months in the country, and I would say quite honestly when I came for the first time, in September, to look around and to meet my predecessor (Roland Folger), I felt immediately a warm welcome and that continued in November when I started. I always had a very good feeling about India. When I came here I found it as a country of very friendly people, very easy to access and very easy to talk to. Also, from China obviously there is some kind of a language barrier which makes it here, for me, much easier. Obviously, there is still a lot of people I cannot straightforwardly communicate [with], but it is not so difficult. So, I was very well received and I have to say I enjoy here. How do you compare China and India? I see that every country has its own development path. China, in terms of infrastructure, is very developed, very enhanced, and I think [in] India there are many projects going on and I see a lot of efforts being undertaken, specifically in the transportation area, and every metro city seems to be building some kind of metro system, which I think is helpful and necessary to ease the traffic in the cities. So, I see the step that China has taken has quite a strong focus on infrastructure and I can see that India also sees that as a vital necessity to bring forward infrastructure. There are a lot of similarities. With people, even though [they] look very different and speak very different, there is a lot of aspirational attitude, there is a lot of ‘we can do’ type of attitude. Your predecessor, Folger, played an important role in regaining Mercedes’s top position in India, and we also saw a significant growth rate at that time in the luxury car segment. What is the roadmap for Mercedes in 2019? The long-term trend in India is very strong, and so I have a clear understanding that the country, the people, and ourselves, they have a good reason to assume that we will have a continuous growth over the years to come even though it is very difficult to estimate the actual impact on every single year. If I look back, and I did a lot of review with my team, to understand how did we develop, why we are where we are, why only there and not further up, what could be achieved here, so, I see that the underlying principle is always there. We believe in the growth, we make new cars available to the customers by opening new segments and we work specifically on the areas of customer service, to have a strong network and be reliable partners to the customers. In this path we will have to continue. That has proven to be successful and there is no intent to modify that drastically. We will continue to build on our products. The products are our strength and we have had quite a success with the product design, the variants we could build and produce and make them attractive for the Indian customers and we will continue to do that. We launched the V Class a few weeks back, that is another way of opening up a segment and defining a space, a market which is not filled yet. So, we go into that and that will remain one of the strategies we have. We will look into making our brand accessible and available across a wide range of products and segments. If we talk about the lead of being No. 1, I am sure you have heard about our motto ‘Best never rest’, so we firmly believe that we have to work in all areas. It is not only the product but it is also how customers will be serviced. The customer service aspect is very important and I am sure you know that we have had quite a successful story on the customer and sale satisfaction last year in which we won two J.D. Power Awards, and I think this is something we need to keep and further grow because at the end the second largest engine you have is your customer. I think the third we need to work on and work with is our network. The network has expanded quite a bit. We have now the biggest footprint among all the luxury carmakers. We will keep the footprint and try to develop it further. Dealer health and dealer profitability combined with a footprint which is conducive for our sales is the third major thing we will be looking at. And again, nothing would completely change the strategy we have been doing so far. What I think will be a little late, which I think we can be a little more pronounced, is everything digital. That goes from our digital footprint in the media to our connected cars. These activities will be even more focusing on our going forward, but again no disruption, and I don’t have a silver bullet here to make India the market it actually should be, but I think a few of these initiatives will be a little more pronounced than before. What are your plans for 25 years of Mercedes in India? A slew of activities. We will have celebrations. We will have a dedicated car launch. We will have employee and stakeholder involvement. So we call it the Brandvocate where we do stories with 25 people and use that for internal and external communication. So we will do something around that activating the press and the community. We will do something engaging with the customers as well, even if it is promotional activity. So it is a full set. Obviously, we are deeply determined to utilise that together with ‘Best never rest’, because you are not 25 years and now it is done. It is always a starting point and any celebration must just be motivation going forward. We have a full activity set up between all the different departments and I’m sure there will be some nice surprises as well. What is your prediction for the luxury car market? I think the long-term trend will be strong for the overall market and I think the luxury segment will keep its space, but I don’t think it will substantially outpace the overall PV (passenger vehicles) market. We have at the moment 1.3 per cent penetration compared to the overall passenger car market, which is a very low number. I would think it would be in a more rounded structure; we would have a much higher percentage. If I say we, then it is the whole top 20 market. I don’t believe that it is going to change rapidly. I think we will more or less grow with the passenger car market at the same pace and if it is 4-6 per cent, we will have a similar growth. So, even though I would wish we see a stronger push into the upgrading of the vehicles, after a few months, I feel it will probably take a little bit longer. I see a trend that people generally upgrade from the non-luxury to the premium and luxury vehicles. The trend will come but I don’t think it will come this year. It will [come] gradually over the years. In 2019, we expect the first half of the year to be more or less stable. For us, we don’t see growth at all because of a very strong first half last year. If you do a year-to-year comparison on a half year base, I don’t think I see a substantial increase here in numbers. Overall, it will be a little bit dependent on the political environment. Some of the hesitation which is on the market in the luxury segment will be released as soon as we have the new government, the new framework setting in, not the political dimension so much, but this year the fact of having a settled and a new government in place will take away some insecurity and should release some energies. We did analyse what happened in the last cycles and we always saw the trend. Before the elections, it would be a little soft—growth would be a little bit on the back foot. But then, as soon as elections are over and people start to think a little bit more mid and long-term again, it would help sales; at least that is what it did in the past cycles. It would continue, assuming that we don’t get any major impacts from outside India. The third quarter, last year, we had some headwinds. Then Diwali and the festive season was relatively quiet; so that was also based on the overall macro-economic situation, not so much made by products and market conditions here in India. So, if we assume that there are no major concerns coming up, then I would think we have reasons to be cautiously optimistic. That’s what we said before, that’s what I believe. What are your plans in EVs and hybrids? When we talk about Mercedes’s plans, we have to separate the brand itself and the overall company, and I would think the company has taken big steps forward. We will make the entire Mercedes portfolio electric by the year 2022. The portfolio, at the moment, is building up on a global perspective. By 2025, the share of all-electric vehicles should represent between 15 and 25 per cent of total unit sales for Mercedes-Benz. This will, of course, also depend upon the development of the infrastructure and customer preferences. [In terms] of the Indian customers, right now we have not taken the decision. There is obviously a few things to consider—where is the customer interest and it is quite diverse. It needs to be a viable operation to us. We cannot subsidise on a bigger scale any cars into the country. At the end, you need demand. What you would also expect is infrastructure needs. Some improvement, as well, in terms of a regulatory framework, but I don’t think that will eventually st op customers if there is no infrastructure. A lot of our customers have a house, covered parking, they can connect and potentially charge their vehicles. On the other hand, I am still not completely clear what is the use case for many customers. Will the cars be suitable to drive from Mumbai to Pune? They should be…. But driving back? Most of the cars could be in the future, but at the moment, I think there is no strong demand for these type of use cases. On the other hand, I can clearly say, I think there will be a trend.